Immensely readable, provocative, challenging, if not always wholly credible- this is Stegner's most mature and rewarding book. From his early novellas- to his short stories- to Big Rock Candy Mountain and Second Growth. 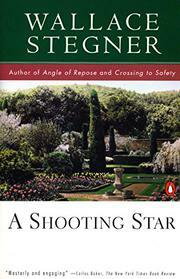 Stegner has given evidence of a major talent. A Shooting Star is full justification for those who have watched what has certainly not been a meteoric career. It was worth waiting for. Some will feel that it is a subject- and a handling-that would have been expected from a Rebecca West, perhaps, rather than a Wallace Stegner. For the central figure is a woman, Sabrina Castro, rich, tantalizing rather than beautiful, at the end of her tether in a marriage that holds seemingly no love and little affection. In a slow spiral of disintegration she goes down through various stages of infidelity and dissipation, always battling with her own New England conscience and her agonized need to be wanted and loved. The story is set against the isolation of great wealth in the Peninsula section below San Francisco- and the neighboring suburban developments -- and against Sabrina's vacuity of heritage and background is highlighted the content and satisfaction of a childhood friend, serene in her middle-class suburban home. It is a compassionate but never sentimentalized handling, which, perhaps, will touch women's sensibilities rather than men's.